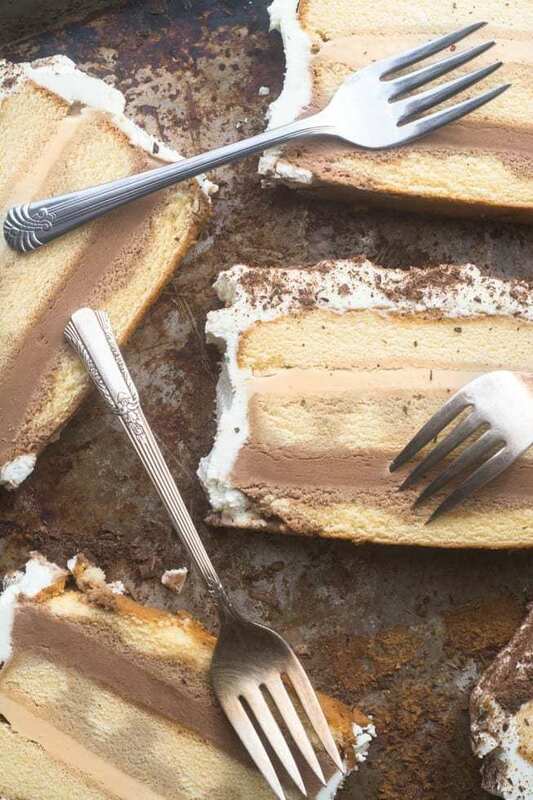 Tiramisu Ice Cream Cake is a summer classic, all grown up and made easy with frozen pound cake and your favorite ice cream coffee and chocolate of course! Remove the frozen cake from the tin and slice into three layers, Line the tin with a long sheet of plastic wrap or parchment, so you can lift the chilled cake out later to frost it. Put the first layer of cake, cut side up, back into the bottom of the tin. Drizzle 2-4 tablespoons of Kahlua onto the surface. Spread the chocolate ice cream evenly over the surface. Put the next layer of cake on top and press down with even pressure to get it on nice and securely. Douse it with the Kahlua. Spread the coffee ice cream evenly over the cake. Put on the final layer of cake, again cut side up, press down evenly, and drizzle with the Kahlua. Wrap the cake with plastic and put back in the freezer to harden, at least 2 hours or more. In the meantime, whip the cream until stiff peaks form. Add the sugar and vanilla after the cream starts to thicken. Fold in the --- room temperature! --- mascarpone cheese. Keep folding gently until it is fully incorporated. When the cake has fully hardened, remove it from the tin and place it on a plate or platter. Coat the top and sides of the cake liberally with the mascarpone cream frosting. Dust with lots of chocolate shavings. Put back in the freezer, uncovered, until ready to serve. If you are keeping the cake for more than a couple of hours, let the frosting harden a bit, and then cover as best you can with plastic.